What Is the Problem When Pea Plants Turn Yellow? The problem occurring when pea plants turn yellow is the incidence of two related wilt diseases. These infections are fungal in nature. Identify companion symptoms that appear with pea plant yellowing for effective diagnosis of the type of wilt attacking your plant. Determine resistant pea plant varieties and appropriate control methods to prevent infection. Fusarium wilt--also known as true wilt--as well as the disease near wilt--also known as common wilt--are responsible for the yellowing of pea plants. Both diseases are fungal infections that occur in nearly every region of the world, caused by the fungus Fusarium oxysporum f. sp. pisi. Of the 11 races responsible for pea wilt disease, race one causes true wilt and races two through eleven develop into common wilt, according to the University of Illinois Extension IPM. Whether affected by true wilt or common wilt, pea plants may display symptoms and illness during any growth stage. With true wilt, lower leaves first become yellow followed by yellowing of the stem that may evolve into an orange and then black color. Pea plants affected by common wilt turn completely into an all-over yellow or yellow-green color. 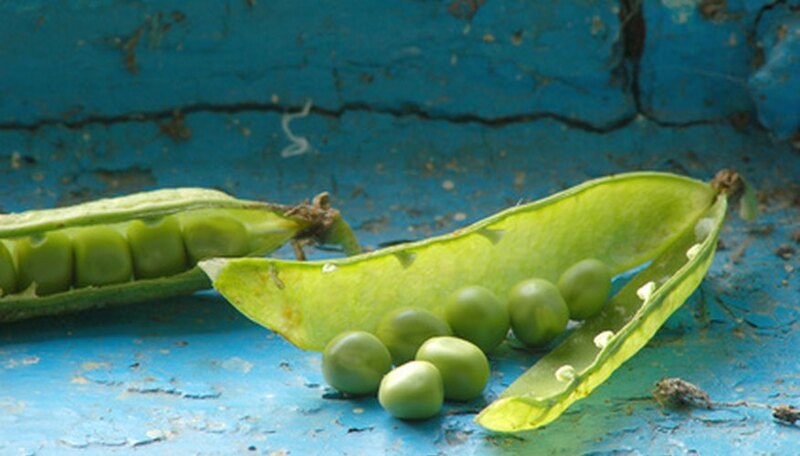 Additionally, true wilt displays downward curled leaves and flattened pea pods. Common wilt displays black, expanding cankers on stems. True wilt damage of pea plants includes stunted growth and ruined feeder roots. Plants may die through a very quick or slow process; pea plants kept in dry soil die at a faster rate than those in moist soil types. Common wilt damage includes malformed seedlings that quickly die, stunted growth, ruined roots and death. Common wilt causes a slow death in pea plants. Fungal spores in wind and water spread easily and infect entire fields, preferring soil temperatures from 74 to 82 degrees F.
Plant pea plant varieties resistant to true wilt and common wilt to prevent problems with infection. Some varieties are resistant to both while others are resistant only to one or the other wilt fungal infection. True wilt-resistant cultivars include shell peas Bolero, Green Arrow, Knight, Little Marvel, Spring and Southern peas, Magnolia, Mississippi Pinkeye, Mississippi Purple, Mississippi Silver and Pinkeye Purple Hull. Common wilt-resistant cultivars include shell peas Bolero, Knight, Lincoln and snap peas Oregon Giant and Sugar Ann, according to the University of Missouri Extension. For control of wilt disease, realize that once a field is infected, there is no method of fungus removal. Since fungi infest soil, fungicides are not effective in removing the disease; any new planting is exposed to wilt infection. Grow only wilt-resistant pea plant varieties. Also, the University of Illinois Extension IPM suggests using a five-year crop rotation, growing other plants in place of peas, to prevent accumulation of fungi. Why Do Potato Plants Yellow & Wither?